How can we talk about suicide? This question is only semi-rhetorical. It’s something we need to talk about more than we do. The suicide rate in the United States is high and climbing, and it’s thought that the suicide rate in America is at its highest in the last 50 years. The number of suicides in America has spiked to the point that it’s lowering our country’s life expectancy. I personally don’t know the right way to talk about it, or to whom. And I suspect that’s something I have in common with most people who haven’t been closely impacted by suicide. We know that it exists, and we mourn when we lose another notable person to it. We then take turns saying something like ‘Wow, I wouldn’t have guessed they were sad’ or ‘Make sure to reach out to those who might be struggling’ but the attention to the problem always wanes after a few months. The show onstage now at TheatreSquared would like you to talk about suicide. “Every Brilliant Thing,” which runs through Feb. 10, discusses suicide rather directly. 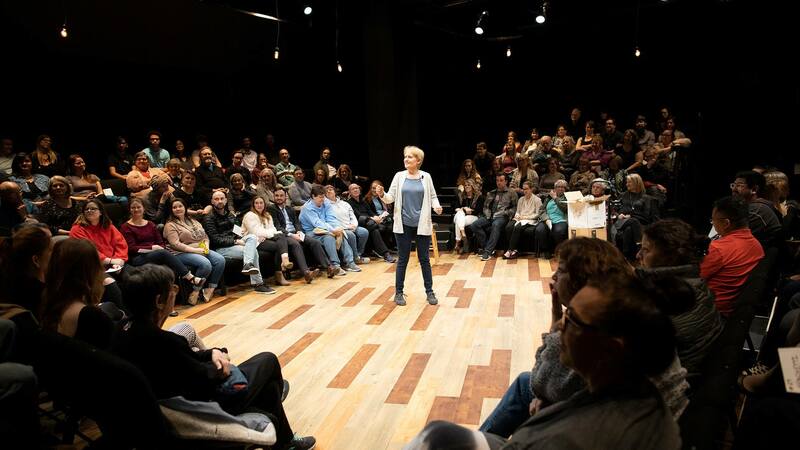 The one-person play’s central conceit is that our main character, played in Fayetteville by Broadway veteran Liz Callaway, has created a list of the good things in life, those things worth living for. These items encompass the “Every Brilliant Thing” of the show’s title. The narrator’s list was started when her character was seven and her mother attempted suicide for the first time. She thought it would be a way to cheer her up, and make sure she knew that life was worth living. “Ice cream” and “people falling over” and “old people who don’t smell funny” are the early entries to the list, which matures as the narrator does. The list continues to grow, but so too does the number of times the narrator’s mother attempts suicide. We’re left to ponder if the list is helpful at all, that a child’s game can thwart something as grim and all-consuming as depression. But “Every Brilliant Thing” works very hard to not be somber. A few minutes of the show do encourage quieter reflection, but those go by in a blink. So does the show – like many one-actor shows, it’s a brisk piece with no intermission. You’ll be in and out of the theater in less than 90 minutes. But do get there early. Before the show, Callaway roams the audience and solicits help for the show. She hands out cards with some of the Brilliant Things written on them, and when she calls those numbers out during the show, there’s the expectation that the audience member will read the Brilliant Thing. These are the most innocuous of the interactions between Callaway and the audience. She asked several other audience members to come onto the stage and help, sometimes just by holding a piano, or sometimes by having a short scene with her. This is a novelty, but done well. An instance where the narrator’s father attempts to discuss what’s wrong with mom as they drove to the hospital – complete with an audience member playing her dad – shows some very smart writing. Playwright Duncan MacMillan collaborated with his original star of the show, the British comedian Jonny Donahoe, to inject humor into the telling. “Every Brilliant Thing” very much wants you to laugh your way into delicate subject matter. It’s therefore a show of big peaks and valleys, of low lows and high highs. As the only professional actor onstage, it’s Callaway’s job to navigate an unwieldy show and topic. Her approach starts sheepishly – she’s supposed to be seven years old, after all – but eventually veers into frantic territory, especially near the play’s conclusion. I’m struck by how difficult this role is. Callaway had every line for 80 minutes, and she had to pick up the way forward after each audience member interlude. She also played piano and sang a bit. It’s a lot to take on, but she looked to be enjoying herself thoroughly, even amid the serious topic at hand. That circles us back to the thing we needed to talk about – our national suicide crisis. The approach of “Every Brilliant Thing” is not to dismiss a serious subject by laughing it away. I think one of the plot elements deep in the show (which I can’t specifically discuss for risk of spoiling the emotion) proves that point well. I still think many of you might feel a disconnect between the light and the dark elements, depending on your own closeness to the subject matter. But I can’t fault the effort to dive into a subject we discuss far too rarely. Is this the perfect way to discuss suicide? I don’t know, but I think the attempt at starting the conversation is a brilliant idea.